Prof. Hernán Galperin (director and founding member of ARNIC) recently co-authored a chapter in the new MIT Press book, Digital Economies at Global Margins. 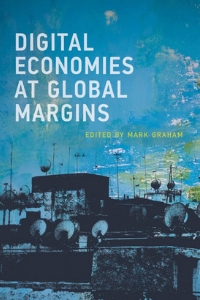 The book, edited by Mark Graham (Professor, The Oxford Internet Institute at the University of Oxford), explores whether the digitalized economy may transcend “spatial, organizational, social, and political constraints,” or if these new technologies reinforce inequalities and marginalization. Galperin, along with Catrihel Greppi (MPA/ID candidate at Harvard Kennedy School), wrote about digital jobs—although these can be worked on from anywhere, data from one of the world’s largest online labor platforms shows that workers outside global economic cores can experience discrimination. For instance, people in these demographics are less likely to win contracts compared with European counterparts when controlling for other characteristics. The book is available online at the International Development Research Centre’s website and will be released in print February 12.